Establishing quality working relationships with teachers, administrators, and support staff. Involving parents in the academic and social activities of the school. Summer School – All freshmen have the opportunity to begin their Ursuline experience with Summer School Physical Education. This summer school class gives freshmen the opportunity to earn physical education credit and, more importantly, gives each student an opportunity to meet their new classmates. Freshman Success Study Skills Program – Each freshman will participate in a special study skills unit in their English classes where they will learn about and practice effective study skills and work habits, which will become part of the classroom expectations from all teachers. Freshman Orientations – The first freshman orientation in May is an optional program that includes class unity exercises, information on athletics and extracurriculars, and the opportunity to meet fellow classmates. The second required orientation in August allows students to familiarize themselves with their locker, class changes, and classroom locations, as well as time to meet with their NHS Mentor. Parent Orientations – Parent Orientation programs are held in May and August. The agenda in May includes tuition, uniform, and class scheduling information. The second orientation for parents includes information on school policies, academic and guidance information, and extracurricular information. 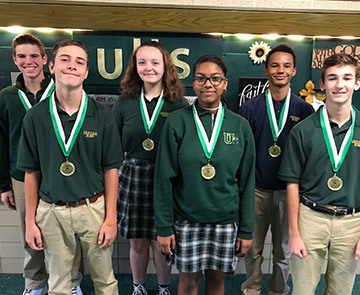 Social/ Class Unity Programs – In addition to all school activities, Ursuline plans several special programs for the freshman, including Freshman Olympics, the Freshman Retreat, and other social activities. NHS Mentors – Each freshman is paired with a senior member of the National Honor Society, who serves as a resource throughout the school year.